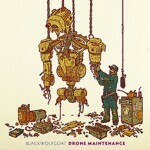 Drone Maintenance is the third full length work of progressive drone conjured by Blackwolfgoat, which is the solo vehicle of guitarist Darryl Shepard (Black Pyramid, The Scimitar, Hackman, Milligram, Roadsaw). The previous two outings, “Dragonwizardsleeve” (2010) and “Dronolith” (2011), established Shepard’s modus operandi of looped guitar parts, building and layering upon each other, to create compositions of dense distortion, delicate lines, as well as purely ambient pieces. 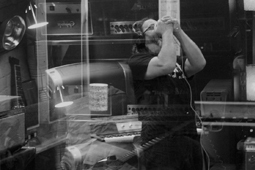 Engineering and mixing duties were handled by Glenn Smith at his Amps vs. Ohms studios in Cambridge, MA. Drone Maintenance is also a quasi-concept album, sending Shepard into the future as a drone repairman, fixing and servicing rogue drones. Musically, Blackwolfgoat’s palette on Drone Maintenance has been expanded to include acoustic guitar and judiciously applied vocal parts, but the main focus remains the electric guitar itself — without any other instrumentation or ulterior motives, and frequently captured live, in one take, with no (or minimal) overdubs of carefully considered embellishments added to the base layer. Inspired by early-70’s fusion, Krautrock, (Randy Holden’s Population II?) and suffocating doom, each song could serve as a soundtrack for an as-yet-unrealized film; yet they stand on their own and transduce their own moods. 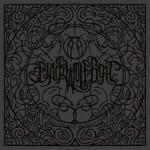 Reviews of Blackwolfgoat’s prior two albums have stated: “Progressive is the name of the game as his music creates a shifting landscape of fuzzed out guitars/ambient noise. His creative use of atmosphere is most striking of all” (Heavy Metal Time Machine); and “Each sonic structure has a distinctly modern and minimalistic texture established on firm but simple foundations, soon evolving, almost organically, into towering edifices and labyrinthine complexity” (Sea of Tranquility). Blackwolfgoat is not just a studio project, either, having performed shows alongside bands such as Man’s Gin and Totimoshi, and with plans to perform once again in the near future. And with artwork once again expertly handled by renowned artist Alexander von Wieding (Karma to Burn, Monster Magnet, Trouble, etc. ), Drone Maintenance urges listeners to leave all preconceptions at the door and take an aural journey to places both bathed in sunlight and cloaked in darkness.